This thread is to facilitate discussion of the events of the tragic NZ Mosque shooting. However, it's going to entertain a lot more than the "one and done" official story. "But it's offensive to the families of the victims to--"
To look for the truth? To investigate all the facts? To verify the story? I disagree. There was a time where professional and independent investigators would be all over such a tragedy with a fine tooth comb. Now it's a cultural meme to avoid talking about these kinds of events at all costs. Who does that benefit? I think it's offensive to victims and their families to swallow the first narrative that comes along and close yourself off to any further information. If there was more to this than just the usual lone nut, as a family member of the victims wouldn't you want to know? Wouldn't you be angry at the authorities for holding back the truth? There will be no links in this thread to Tarrant's manifesto or his shooting footage. Here we go. Mossad, short for HaMossad leModiʿin uleTafkidim Meyuḥadim, is the national intelligence agency of Israel. It is one of the main entities in the Israeli Intelligence Community, along with Aman and Shin Bet. Mossad is responsible for intelligence collection, covert operations, and counterterrorism. Wherever national intelligence agencies are, there you will find something interesting. There was an earthquake in 2011 that happened in the town of Christchurch, New Zealand. That earthquake exposed a secret Mossad spy ring. I can't even begin to speculate on what Mossad was doing in Christchurch, NZ of all places. Who the hell knows but Mossad? Whatever they were up to, it had some weight to it given the size of the operation. Possibly radicalizing young Muslims. One Israeli found dead had 5 different passports on his person. The story was quickly buried after the NZ PM dismissed everything. “The unusual circumstances which triggered the investigation was the rapid departure from the country of the three surviving members of the group of Israelis in question,” the PM said. “Security agencies conducted the investigation and found no evidence that the people were anything other than backpackers"
Fred Tulett, editor of the Southland Times, said an “extraordinary” reaction by the Israeli government in the hours after the earthquake had heightened the suspicions of New Zealand’s Security Intelligence Service. They included the fact that Benjamin Netanyahu, the Israeli Prime Minister, made four calls to New Zealand's Prime Minister on the day of the earthquake. Brenton Tarrant, the Mosque shooter, visited Israel in 2016 as part of a world wide trip. Visiting Israel is not exactly a smoking gun. Israel is popular tourist destination. However, Tarrant was not a religious guy nor did he seems like an ancient history buff. Israel is en route to his other destinations but it has no relationship to them in any capacity. Why get a 3 month Visa? Is that part of Israel's requirements? To add to the mystery, he was only there for 9 days. What a waste. To put a cap on this part of the discussion topic, Tarrant came from a modest middle class family yet was able to travel extensively. Not unheard of with part time jobs, etc. but a noteworthy point. Israel's more devastating attacks against Gaza seem to coincide with mass shootings, including this most recent one. I realize Israel fires a lot of rockets but the the biggest hits coincidentally happen on the dates of the biggest mass shootings. Emphasis on "coincidentally" - it could be nothing more than that. When a major event like a mass shooting happens, the first reports are the most crucial to pay attention to. Take them with a grain of salt to filter out bad intel but pay attention to the first reports because you may never see or hear that information again. It happens over and over. The "dancing Israelis" on 9/11 are a great example of how one narrative is pushed while minor details from initial reports are buried at the same time. I am not talking about bad details that are discredited in the next story, I am talking about important details that are just thrown in to a memory-hole and never discussed at all. "Dancing Israeli's" and in this case, multiple individuals assisting Tarrant. 5.31pm - Four people are in custody, including one woman, Police-Commissioner Mike Bush told media. 5.27pm - A witness told NZME a well known Muslim local chased the shooters at a second shooting at a mosque in Linwood. "Newshub political editor Tova O'Brien says police have confirmed it was a multiple, simultaneous attack." Another man told Magic Talk he saw people running out of the mosque, and that he had seen a man in military gear with a high powered gun. "I heard what I thought was a real loud backfire of a car," the man told Magic Talk. "And the next minute I turned to my right and just saw people running out of the mosque, and obviously just a couple of more shots and a lady fell over and then a guy in full military gear with what looked like a really high powered gun pointing down the road firing"
"Full camo gear and he didn't look like he had a care in the world"
Anyone else like to casually stroll the streets in full camo near a Mosque that's being shot up? Glad I'm not the only one! I wonder what he's carrying in those little pouches on the ground.. Multiple Mosques, multiple cars, multiple arrests but only one shooter? Given the distance between Mosques, something doesn't add up here. 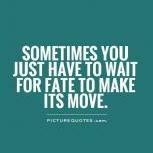 It may be possible to pull it off as a loner but the inconsistencies don't stop there. There is a cell phone video circulating that clearly shows two young men with assault rifles near one of the Mosques. They appear to speak briefly, slap hands then one goes left and one goes right down the sidewalk. White t-shirt standing in front of black t-shirt. The baseball caps and clothing rule out Tarrant as it does not match his arrest attire at all. The video is being pulled like crazy so here's a still image. When they part ways, there is no question they are both holding rifles. The suspects, as many as 5, were eventually released or simply vanished. The distance between the two mosques seems to show that the terrorist would have no chance to get to the second mosque if he were alone. Those of you with a keen memory may have noticed the odd timing of Police or Government "training sessions" during major tragedies. On 9/11, the Air Force was away on training as per the Bush Admin's direction, rendering them unable to intercept the incoming planes. There was FBI training in the area of the Pittsburg Synagogue shooting very shortly before it occurred. The list is long and full of coincidences. 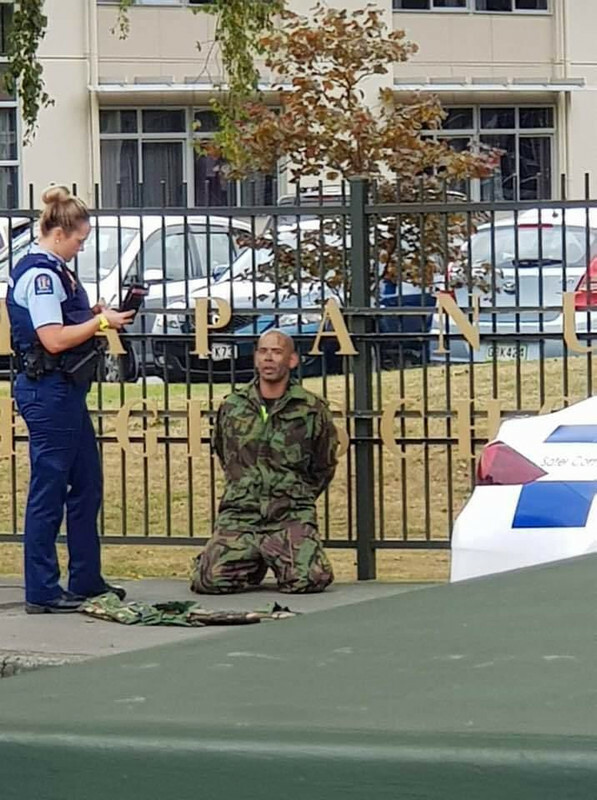 In Christchurch, the Police officers who arrested Tarrant happened to be where at the time of the mass shooting? In training at the local Hospital on how to deal with "armed offenders". On that same day, snipers from several countries were at a shooting event just 25 KM West of Christchurch. They were also deployed to deal with the shooters. I will concede that the sniper event is probably unrelated, though the timing is curious enough to add it here. Part 4: "Shut it Down"
Tarrant strapped a GoPro camera to his helmet to record his rampage from start to finish. I'm not sure who the footage was intended for. Either way, there has been a big scramble to scrub said footage from every corner of the internet. Surely because it's violent and offensive, correct? Maybe. Yet these same networks who are calling for a ban are the ones who kept beheading videos in the news cycle, or footage of pilots being burned alive, the 9/11 attacks, etc, etc. They have no shame in publishing horrific video when it suits them. Go back through the records and you can watch CCTV footage of all kinds of horror (just be sure to click the "18+" confirmation button on the way in). This tragedy however is being treated a little differently. 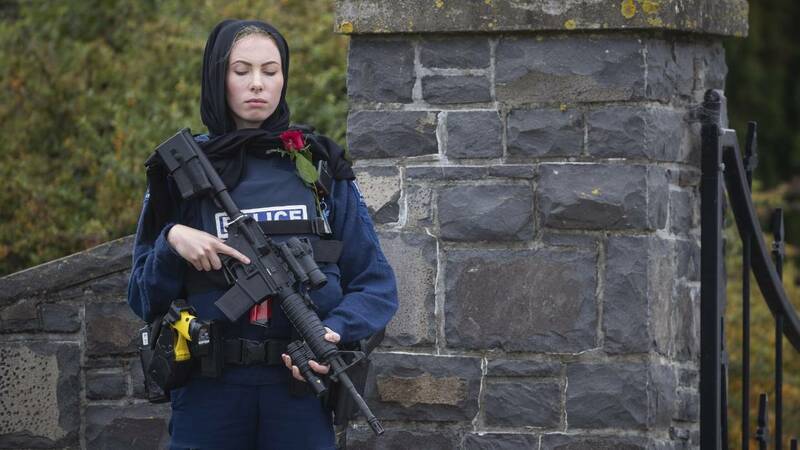 "The live stream video of the shootings in Christchurch has been classified by the Chief Censor’s Office as objectionable," Police added. Sky News Australia was taken off the air by New Zealand's largest satellite provider after the network repeatedly showed clips of the shooting. I understand the desire to curb the influence that footage might have on an impressionable young psychopath but this is simply another form of censorship. Do we not have enough monitoring tools in place to detect potential radicals? Something smells fishy. I expect this to happen on almost all mass shootings going forward. On paper, it saves us from "offensive material". In reality, it prevents any contradictions to the mainstream narrative and it protects Police from being scrutinized. Every shooting has been analyzed by intrepid basement dwellers which is not good for business. Gag laws exist for a reason. TALLAHASSEE — A Tampa Bay lawmaker wants to prevent the public from seeing photos and videos or listening to the audio of mass shootings like the one that happened in Parkland last year. The reason for the measure, said Sen. Tom Lee, a Republican from Thonotosassa, is that such material can be turned into profit, exploiting the victims of the tragedy in the process, or it can be used for more nefarious purposes. The Senate Governmental Oversight and Accountability Committee on Tuesday backed Lee’s Senate Bill 186 that would create a public records exemption for material related to mass shootings in which three or more people, not including the killer, are slain in an intentional act of violence. A similar bill, House Bill 7017, is slated to be considered today by the House Criminal Justice Subcommittee. One suspect was charged with "weapons offences", "not related" to the Mosque shooting. NZ Gun Laws - Basically, it says you can't possess a semi-auto without a special permit. There are work-arounds due to the definition of "semi-auto" but the rifle Tarrant had was completely illegal due to it's modifications. While that might seem trivial, the modifications themselves required a special permit to purchase, possible requiring military contracts (feel free to correct that). This is New Zealand we are talking about here - not Houston. Guns are heavily restricted. Official reports say all guns were obtained legally. The location of police stations in and around Christchurch shows that there were several just a few blocks away from the Mosques. This is about a seven to eight minute drive with normal traffic. But witness statements say that police took over 20 minutes to arrive at the scene (the police response time was actually 36 minutes). Ambulance services took over half an hour to arrive at the scene despite the fact that hospitals were in even closer proximity to the attack locations than police stations. Tarrant's gun was scrawled with graffiti. Many were alt-right memes, there was a #ROTHERHAM, another referenced immigration laws. Tarrant's words and actions are inconsistent with the alt-right message boards he claims allegiance to. He urged followers of the Facebook live streamed video to "subscribe to PewDiePie" (a popular YouTuber). Again, that doesn't make any sense in the context of the alt-right. Pewdiepie has repeatedly disavowed Nazis, the alt-right, etc. I'm sure there are many more inconsistencies, coincidences and points of interest to add here. The thing to remember with conspiracies like this one is that you will probably never find that "smoking gun" irrefutable piece of evidence that ties it all together. Instead, think of it like a jigsaw puzzle: you have lots of pieces that you know belong in the same box, you just aren't sure how those pieces fit together. Just don't throw those pieces in the trash because someone else told you what the puzzle is supposed to look like. Put it together yourself. ...it's been a slow work day for me. Brave soul, huh? If the thread stays open, I'll have a go tomorrow. @ Dark_Grey: Thanks for going to the trouble of typing that out, it's very interesting. They are pretty spot on and not easily distracted. Something is fishy about the whole thing. You might be on to something. Anyone care to make a wager that Trump will be implicated? I really don't mean any disrespect to these dead. It's just that the world is so damned crazy today that you have to laugh or go crazy yourself. This mass-murdering zealot will, unfortunately not be the last nor even the most vicious or successful. There seems to be a contagion of hate spreading across the world. "Going viral" is a very apt description of the process. If the internet is compared to a hive mind, I think it needs professional help before total madness sets in. I implicate Saudi Arabia and Israel. It seems like they are both part of the problem. Not the solution. Ataturk brought a end to the Ottoman attitudes and Turkish Muslims are a whole different breed than the garbage in the Middle East. They're civilized. Even Erdogan's conservative attitude is about holding power. Not that he actually is one. Israel is like every other country, they look out for #1. S.A. is messed up on so many levels there isn't any good place to begin illuminating them but the real conflict is about the Sunni/Shia divide. IMO, Ataturk brought sanity to that country and it thrived for many decades. Erdog is blinded by his own fantasies of greatness and he's going to turn Turkey into a police state of the worst order before he's done. Fundamentalist Islam is nothing more than Fascism with a religious wrapping. It will lead to horrors for the Turks and it makes me sad for them, even the willing participants who think of him as some kind of hero. You can't fix stupid but stupid can sure as hell kill you if you give it a chance. I'll take your word for it. I haven't traveled there nor do I personally know any Jews on a close basis. My support is for the rights of those people to be in that land and it will never be swayed, regardless of how nasty and totally human, they prove themselves to be. I think most people who are against the state of Israel are well-meaning and consider the Palestinians to be underdogs and downtrodden. That doesn't disturb me, I can understand that sentiment. What I can't swallow is the blind ignorance of blaming Israel for the entire conflict and justifying every act of the Palis simply because they're supposed to be "resisting occupation". My belief is that Israelis are no better or worse than any other group of people considering their history of being kicked out of every nation they've made a home in. What is fascinating to watch unfold is the absolute, irrational hatred that is held for them and their country. It's the size of a postage stamp. It's literally 1/1000th of the land that Arab Muslims possess around them, yet the world cannot rest until they are scattered again. It's obviously going to lead to regional, perhaps global war, with a side of nuclear detonations yet the world cannot stop the desire to destroy them. No matter how one feels about them or their nation, you have to admit that there is nothing else on the planet as bizarre and self-defeating as this hatred and passion directed against them. When they come to burn them this time, they aren't going to burn alone. So be it. My Jewish friends are all anti-Zionists. So I guess they are "self haters". Then again, they all went to Quaker School with me and according to the "Donald Definition", Quakers are "anti-Semites". From a Native perspective. I see the Palis as resisting occupation. They are not "Arabs". They are Palis and historically Jews were just another religious group there. Not a ethnic group. I was there. They stomped all over their rights and stole their land. We pointed it out and got booted. @and then I don't justify violence for ANY reason. I can accept that perspective. I obviously don't agree totally with the premise but reasonable people can disagree, reasonably. I'm curious though. How do you think the conflict will be settled? More importantly, do you think it worth the risk of a nuclear strike to achieve what the world considers to be justice for the Palestinians? And dude, they are most definitely "Arabs" They are self-described descendants of Ishmael and those are called Arabs today. With your background, I can see why it would be the last choice. You've seen the real consequences. This isn't about what you or I want or care to justify, however. I'm talking general terms and historical contexts. Do you think one side will ever prevail and do you believe that removing the Jewish people from what you consider to be Palestinian land is worth risking a nuclear confrontation? No and no, I do think they both need a foot up their butts. They are both going to extremes. It won't end well no matter who "wins". I think T.E. Lawrence had the greatest plan where they all live in peace. But that idea was killed with a fast motorbike long ago. They are self-described descendants of Ishmael and those are called Arabs today. That's a Muslim belief. Some Turks and Iranians claim that. I don’t know where the supposed video was taken in your original post but that isn’t in Christchurch. The video was censored because it shows the violent and horrific massacre of real people. Of family members. I have heard people complain it is censorship. Do the people who complain think we should allow the distribution of all videos or just the ones they want to watch. Has anyone on here ever experienced seeing a loved one cut from a vehicle in the news? I have, it is a wholly different experience. To know that that is not just a body but that that is John or Sarah or Karen. To know that your government did nothing while the video of your innocent 3 year old son/cousin/nephew being massacred during prayer was being distributed for entertainment. I just can’t even understand why anyone would want to watch it. It is equatable to *** Blocked ***ography. But it’s ok to censor that to protect the families and victims. Some of the comments under the post suggest that followers of the “green religion“—a sometimes derogatory term often used on the Chinese internet to refer to Islam because of the significance of the color to the faith—brought the attack upon themselves. “The green religion launches terrorist attacks everywhere, and now the attack finally comes to them… Green religion is backwards, stupid, barbaric, and violent,” said one such comment. China has been going after Muslims with a clenched fist in recent years. I poke fun at the term "Islamaphobia" quite often because in Western nations, it's often applied to superficial statements. In Communist China, "Islamaphobia" means literally rounded people up and throwing them in to "re-education camps". Insanity. There are e about 10 million Uighurs (Muslim minority,) in China. As many as 1.5 million of them are doing hard time. China bulldozes Mosques or just shuts them down based on thin excuses. I have no idea why Mossad would spend all of that money on a shooting in New Zealand. There where 4 people arrested. The shooter: currently behind bars. A man seemingly just wondering the streets in Camo “coincidentally “ during a shooting,according to your description. I could just about guarantee there are probably 3 people in my town right now wearing camo gear. NZ is a big hunting and fishing place.Hunters where camo. And they don’t go home to get changed before heading out for milk or smokes. NZ is a large farming community farmers where camo because it is durable,warm, and farmers are often also hunters. It becomes their everyday clothing. Fun fact Christchurch airport is one of the only international airports I am aware of that if you turn left to exit you are instantly in farm lands. It is actually surprising it was only 1 person in camo. Well done to the police for checking though. That leaves two more. A man and a woman. Who took a gun with them to pick their child up from school. Schools where on lock down and it was a scary place to be I imagine. Having been close to only one other active shooter event in my life (Eric Gellatly) I can only speak from my own experience. 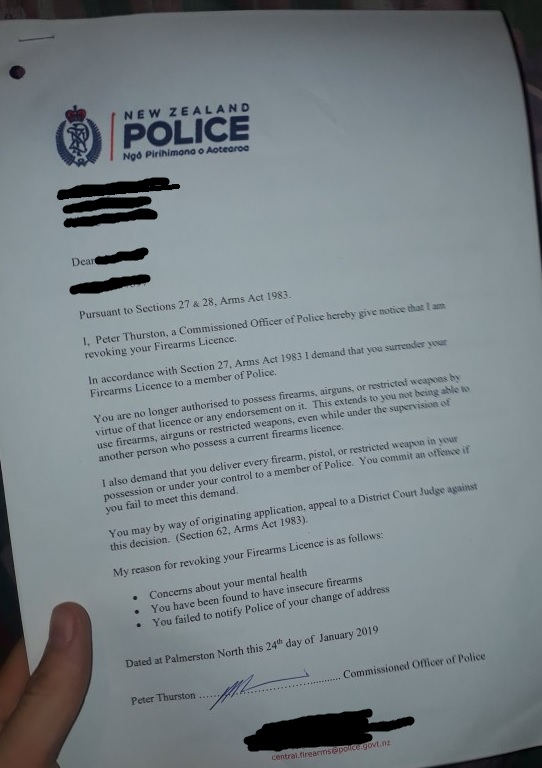 Carrying an unsecured gun in NZ is illegal and I would bet dollars for peanuts that was the firearms charge made against a seperate gentleman. That gentleman being the male in the aforementioned couple. You have a screenshot allegedly showing 2 people with assault rifles high fiving each other. Christchurch is not a big city. And I am very very familiar with it and it’s surrounding suburbs. The trees and the fence as well as the style of buildings in the background are not familiar to Christchurch. Edit to add: just google Linwood the suburb involved if you can find anything like those trees and that fence or that street scape I would be shocked. New Zealand Gov response - too much, too soon? If that were the case, how did Tarrant slip through? The next response by the Gov was public displays of sympathy for Muslims. I believe I posted this in the original thread but all women are encouraged to don a "headscarf" to show solidarity with Muslims. Next was to play the Islamic "Call to Prayer" at a park near the Mosque. What a sight that must be. You see the Prime Minister on TV wearing a Hijab while outside you hear Islamic chanting in the park where thousands of your fellow countrymen are wearing Hijabs and praying to Allah. Expressing sympathy is good and healthy. But this is starting to look like virtual signaling mixed with cultural submission. Wearing the oppressive garb of Islam (no offense,) regardless of your intentions, could be sending the wrong message about your nation's core values. this is incredibly Atypical of Christchurch.remember most of it is new buildings and suburbs built after 2011 there is not a lot of dingy 1970’s style shopping areas. I think it's offensive to victims and their families to swallow the first narrative that comes along and close yourself off to any further information. I can understand that on a small level, however, as someone who has spent 15 years now working in various forms of emergency medical service I will say be very wary of applying motives or intentionality to the chaotic first reports out of any mass casualty situation. That looks very similar to the street that the gunman drove down when he was shooting at people through the windshield. If you wish to discuss the evidence you are presenting then let’s do it. As far as I can tell the only evidence that you presented that could possibly connect the shooter to Mossad is that he once travelled to Israel. Every thing else is circumstantial or not connected with this particular event. That is because it very nearly is the same street. But it looks nothing like the screenshot in the op claiming to be of Christchurch. The op pic is not from Christchurch. Eh, yes and no. He isnt denying antisemitism there, he is only denying hating jews who he dont affect him directly. This is quite consistent with the alt right tactic of softening the language just enough to provide plausible deniability to "outsiders" while still getting their message out there in the public sphere.